Senior cat litter box problems happen all too often and aren't necessarily a reflection of the cat's previous habits. Whether your cat failed to learn faithful toilet etiquette as a kitten or simply developed litter box problems as it got older, such issues are common with advancing age. Some senior felines never have any litter box problems. But it's good to be proactive and learn the warning signs in case any issues arise that lead to potential toilet challenges with your cat. Diabetes, kidney disease, and lower urinary tract infections, all conditions that are fairly common in older cats, cause more frequent urination. Your cat may not be able to get to the box in time every time. Several medical conditions, such as arthritis, may cause your cat to associate the litter box with pain. Even though it's not the litter box or the act of using the box that's causing the pain, all the cat knows is that if it doesn't use the box, it doesn't have the pain. It may find another place to do its business where it doesn't have as much discomfort. Your older cat may have developed feline cognitive dysfunction, or FCD, a form of cognitive decline characterized by such symptoms as deterioration in memory, sight, hearing, and ability to learn. Separation anxiety, which your cat may experience when you're away from home or the cat is placed in unfamiliar surroundings, is another reason it may not use its litter box as intended. Regardless of the root cause of your cat's litter box problems, you may need to try one or several approaches to help it use its box as intended. Cats are meticulous by nature and appreciate privacy. Senior felines, like some older people, become less patient and more particular as they age. Thus, a cat that may have easily tolerated a less-than-stellar litter box as a youngster may snub the box if it's not pristine or seek other places to eliminate if disturbed during the process. 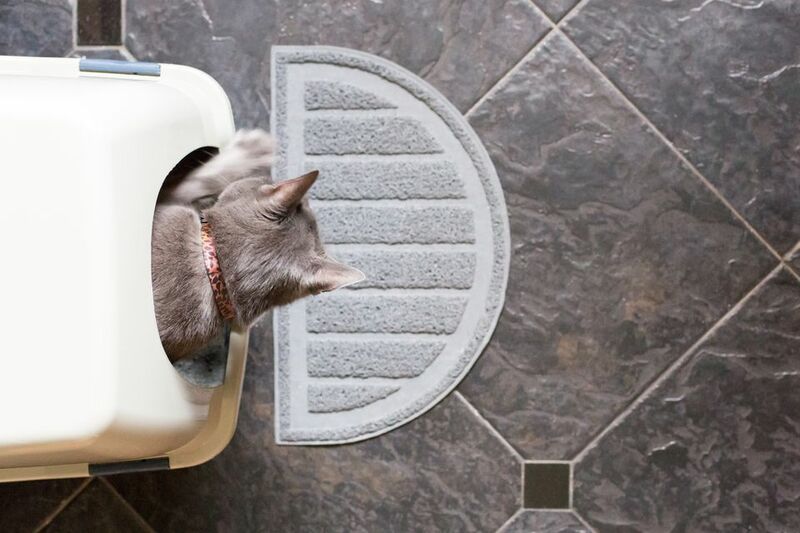 Avoid this by keeping the litter box immaculately clean, easily accessible, and in a private space. A low-traffic area—away from the cat's bed and food bowl—is ideal. Older cats may lose bladder tone as they age or have other physical ailments that make it difficult for them to "hold it" long enough to run across the house or down the stairs without an accident. Make it easier for your cat by placing litter boxes on each floor or at each end of the house. A regular commercial litter box may be too tall for arthritic cats to climb in and out of. More than 70 percent of aging cats have arthritis, so it's important to have a litter box that's the right height. Because it may hurt the cat to get into the box, the sides should be low and easy to climb over, and there should be plenty of room to allow the cat to take its time in comfort. Look for a plastic shirt-box-size storage container, use the lid of the container itself, or cut down the sides of a regular box. Aluminum disposable bakeware that's about the size of a roasting pan may work as well, and the height of the sides can be modified if necessary. Some older cats develop cognitive decline that makes them forget where to find the litter box and what to do when they get there. If your vet has diagnosed your cat with cognitive decline, she may prescribe medication, such an anti-anxiety drug, to help ease some of your kitty's issues. You can also help your cat to cope by maintaining consistency in its surroundings and daily routines. Many cats of all ages don't tolerate change well, but with older cats and especially those with separation anxiety and various degrees of cognitive decline, consistency in all things becomes even more important. If your cat's vision is also impaired, this is another reason not to change its surroundings. Blind cats memorize the locations of important property, like a favorite nap spot, their food bowl, and the location of the litter box. You may not realize that your cat has lost its vision until you rearrange furniture or move the litter box. To give your cat a better chance of finding its litter box without undue stress, it's best to keep the box in the same spot. If you must make changes or move the litter box, leave one recent deposit in it to help your cat find it by scent. Try to be patient if your cat needs to learn the new location of its litter box and has a few accidents in the meantime.